“It is quite clear that Takt is a foreign word (外来語) to both English and Japanese. Its origin could come from German : Taktzeit. Therefore, Toyota could have adopted the term and application from Mitsubishi who had technical link with the German in aircraft manufacturing. Lean implementers in Germany today, however, are just as confused about it as Americans, and I have heard some refer to Takt as the process time. But how exactly did “Takt” migrate from Germany to Japan? I think the key reason the Japanese consultants Frederick worked with didn’t dwell on it is that it happened during World War II, and that Japan’s war time alliance with Nazi Germany is not a source of pride. Digging further on the input from Casey and Bertrand, I found in Americanization and Its Limits a chapter by Katsuo Wada and Takao Shiba reporting that the military aircraft arm of Mitsubishi learned about the German “Takt system” from Junkers engineers in 1942, and had implemented it in the Nagoya works in fuselage assembly by 1943, under the name of zenshinshiki (前進式?). From a contemporary observer’s description, it looks very much like the pulse line system currently used for military aircraft at Boeing, with fuselage sections assembled at fixed stations and moved at a fixed interval — the Takt — to the next station. This is to be contrasted with the moving assembly line concept used for aircraft also in World War II by Ford in Willow Run, MI, for the B24, and currently by Boeing for commercial aircraft. And it is not the same concept as takt-driven production today. 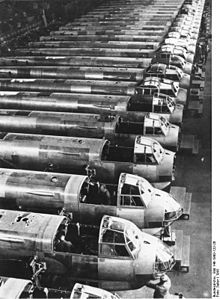 But there are also accounts in German Aircraft of the Second World War of the German aircraft industry using moving lines for subassemblies during the war. The Nagoya location of this Mitsubishi plant may not be coincidental to the transfer of the term to Toyota, which is still headquartered in that area. It may have been carried in the heads of unemployed military aircraft engineers joining Toyota after the war. University professors who write textbooks tend to copy from each other (i.e., plagiarize ) out of necessity (publish or perish). Unfortunately, most have analyzed a manufacturing facility only from the outside. ‘Takt’ is not the only unheard of and unused term in business textbooks. Not sure about the word Takt but to calculate tasks by the hours/minutes to maintain continuous flow is a concept used for ever and ever, thought Takt came from the word beat… My father ran a company that used a belt line with different color dots the operators would build subassemblies and required to hit the dots, every hour the supervisor update the whiteboard with how many finished products were produced against a predetermined goal.. sounds like Takt to me…1980’s but I was told the beltlines were there since the early 70ies….. Differences in details matter enormously on this topic. Producing to a target number of 60 units/hour sounds the same as producing to a takt time of 1 minute. Mathematically, it is the same information expressed by one ratio or its inverse. In practice, it’s different because, when you say 60 units/hour, you imply that it doesn’t matter whether they one comes out every minute or all 60 of them at once at the end of the hour. When you produce at a takt time of 1 minute, on the other hand, it means you are putting out one unit every minute like clockwork, and a line designed to achieve this will not look like a line designed for 60 units/hour. I can’t tell from what you wrote whether your father’s line ran to takt or not.